Chances are if you are a pastor or if you work with one, the following question has come up, “when are you (or when is your pastor) planning to publish a book?” It’s fairly common for a pastor to want to write a book, especially after the number of years they spend in study. After writing dissertations and papers galore, along with years of writing sermons, pulling together a book shouldn’t seem too daunting. Yet, it still is. There are various reasons a pastor might consider publishing a book. They might have education and subject expertise in a specific area of theology; they might want to reach a certain group or people that are under-served; they might want to create a resource to encourage their congregation and church visitors. 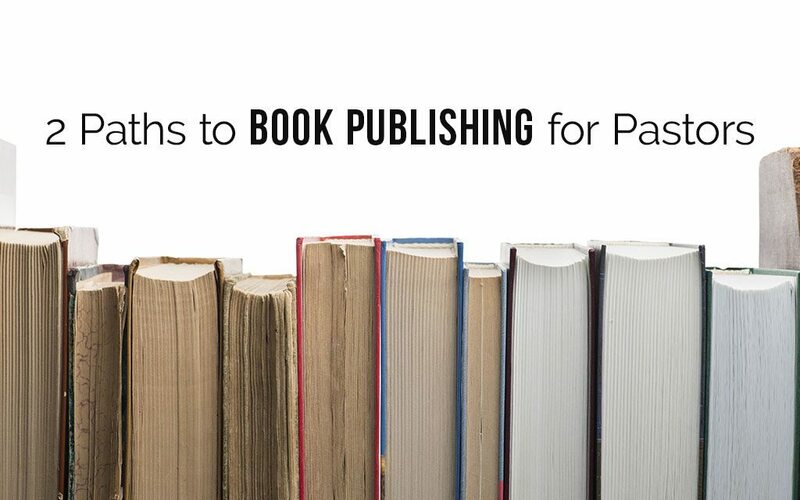 Whatever the reason a pastor feels called to write, there are two simple paths to book publishing to consider. Traditional publishing involves writing a book proposal that includes the book outline and several chapters of the book and submitting it to a publishing house’s acquisitions editor for review. If the publisher likes the idea, they may reach out to discuss and tweak your proposal before discussing a book contract with you. For more well-known pastors, this is often the path they choose. The process can take much longer than the second option of self-publishing. However, if the book has wide appeal, it can be a great option–if you have the time and patience to submit and re-submit book proposals to multiple Christian publishing houses. Michael Hyatt’s Get Published audio course is a great tool to learn more about book publishing. Some of the top Christian publishers include giants such as Zondervan, Moody Publishers, Dove Christian Publishers, Bethany House, and Thomas Nelson. Smaller Christian publishers include BakerBooks, B & H Publishing, Harvest House, Abingdon Press, and Lexham Press to name a few. If a pastor feels called to share his message well beyond the four walls of their church community, going with a traditional publisher can be a wonderful, albeit slow, process. However, if the main aim is to create a resource the church welcome team can hand to new visitors and disciple the flock within the church, self-publishing might be a better way to go. In the past 15 years, the publishing world has changed dramatically with the evolution of the ebook. Amazon has forever changed the face of book publishing, in essence, making it possible for nearly anyone to publish. Now, Amazon offers print on demand solutions if you want print copies alongside the digital version. While ebooks can be published through Amazon Kindle Direct Publishing, things change quickly and it might not be the easiest thing to wrap your head around. Most pastors aim to excel at what they do best, and book publishing might not be something they have the time or energy to unpack. Self-publishing companies abound, yet it can be hard to know who to trust to do a good job with your book while offering the services you need like book jacket design, editorial services, marketing help, and help with formatting your book for Kindle, Nook, and other digital resellers. Book Baby is a US-based full-service publisher that works with authors of all types to create professional print and digital books. Book Baby is a one-stop shop that assists authors from book design to editing, to layout, to ebook formatting, to marketing. They also specialize in first-time authors. “It’s not just about the sales of the book. Do they have a good Author Page on Amazon? Are they successful on social media? We’ve found that 35-40% of our publishing is in the spiritual category,” says Steve Spatz, president of Book Baby. For a very reasonable budget, pastors and their churches can embrace book publishing as a vital component of its outreach strategy. The world of publishing has changed dramatically and there has never been a better time to get on the path to book publishing.